Minnesota has been among the most restrictive medical marijuana markets in the United States for years, with only two licensed producers serving all registered MMJ patients, a ban on edibles and cannabis flower and a narrow qualifying conditions list. 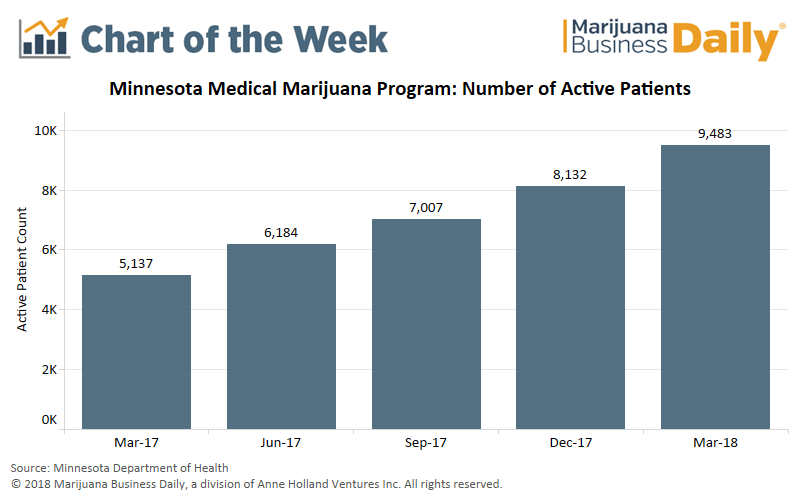 Those factors add up to a small patient pool and questions about whether Minnesota’s two vertically integrated MMJ companies – LeafLine Labs and Minnesota Medical Solutions – can survive in the long term. But over the past 12 months, the two businesses appear to have gained ground. From March 2017 to March 2018, the state added over 4,000 MMJ patients to its rolls, an increase of 85%. Although that’s still a small number of customers for a state the size of Minnesota – which has a population of over 5 million – it represents progress. Last August, patients who suffer from post-traumatic stress disorder were allowed to buy MMJ. In 2016, intractable pain patients were added to the pool. Those two additions accounted for thousands of patients signing up for the MMJ program, according to state data: 66% of registered patients report using MMJ to treat intractable pain, and another 10% use it for PTSD. More changes are on the way. Effective in July, autism spectrum disorders and sleep apnea will be added to the qualifying condition list for MMJ. However, it remains an open question whether Minnesota’s two MMJ producers can become profitable in a program that remains relatively restrictive. As of March 2017, the companies had lost a combined $11 million in their first two years of operations. The patient count increase should help alleviate the red ink. But whether it’ll be too little too late remains to be seen. For the companies to survive, the state will likely have to continue tweaking the program to broaden access and bolster the patient count. If it doesn’t, Minnesota could become a cautionary tale for future states that legalize MMJ and hope to throw its operational difficulties onto private industry’s shoulders. Here’s the kicker: “For the companies to survive, the state will likely have to continue tweaking the program to broaden access and bolster the patient count.” As officials just admitted in Pennsylvania, that “tweaking” must include sales of cut-and-dried, seedless, female cannabis flowers. No public official in America has the right to deprive qualified patients of smokable plant material—if that’s how patients choose to consume. The exact same problems described in the article are affecting New York, since both the MN and NY programs were designed in part by Dr. Kyle Kingsley of “Minnesota Medical Solutions” (the corporate parent name is Vireo Health). In 2014, when the laws establishing both state programs were passed, men like Kingsley and NY Gov. Andrew Cuomo apparently conspired to “recreate the wheel” of medical weed—without seeking any public input. It was most likely Cuomo and Kingsley who caused these financial problems by insisting that companies adhere to strict “vertical integration” rules (selling products they produce instead of allowing independent companies to distribute and sell, etc. ); and by arrogantly imposing the infamous “no smoking” mandates as a model for other states to follow. Obviously, this shameful political interference in MN and NY raises prices for companies too much (see the $11 million “lost” in 2 yrs part) because it forces them to buy costly extraction and processing equipment. In turn, that makes the medical cannabis products (most not covered by insurance) way too expensive and drives away patients. If MN and NY companies could operate more freely and sell raw plant material, extracts and edibles, they surely would see much better profitability. The political interference is actually raising prices for companies which eventually result to losses which will also have effective of higher prices of medical cannabis products.